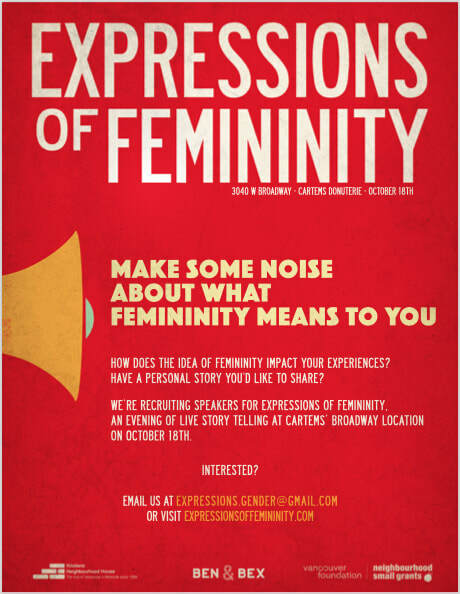 Join us on October 18th (5:30-7:30pm) at Cartem's Donuterie to share, learn, and support one another in our diverse experiences and relationships with femininity. Funded by a Small Neighborhood Grant, this event invites cis, trans, nonbinary, two-spirit, queer, and/or otherwise identifying persons to tell their stories. Come see me recite my poem BLESS THIS GODDESS and honour the diversity of feminine expression! Join my mailing list for news on upcoming events.